Since some customers recently reported XTOOL PS2 GDS Gasoline software “License Exception” error, below is the solution for sharing! How to solve XTOOL PS2 GDS software error “License Exception”? According to XTOOLESHOP technical support engineers, you just need to format the SD card then update XTOOL PS2 GDS software to latest version! And no issue anymore! So how to update XTOOL PS2 GDS Gasoline software to latest? 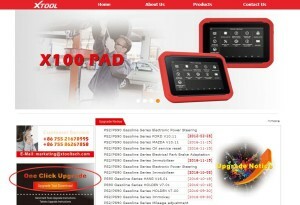 You can go to XTOOL official website (www.xtooltech.com) and click the One Click Upgrade to download XTOOL Update Tool. How to solve the problem of license error of xtool pad? What function does xtool ps90 can do?